Politics here is sort of interesting. Bahrain is an Arab country, and is one of the six members of the Gulf Cooperation Council (including Kuwait, Oman, Qatar, Saudi Arabia, and United Arab Emirates). 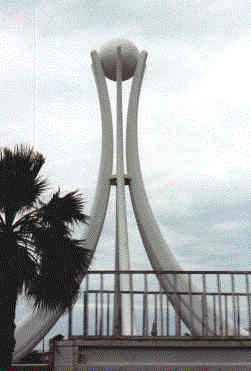 This immense sculpture in the middle of the King Faisal Highway shows a pearl being supported by the six countries. The king here is called an Amir. His name is Shaikh Isa Bin Salman Al Khalifa. It turns out that the only name part is Isa, after the prophet (to them) Jesus. Bin Salmon means son of Solomon. (Bin means "son of" like "ovich" in Russian, or "Ben" in Hebrew.) Shaikh is the title, that we’ve known as "Sheik". Al Khalifa turns out to be their family name, but it sounds to my ear like Caliph, the title of a Moslem religious leader. It is indeed a kingdom — an anachronism in the modern world — with all that that implies. It is not clear how long this can continue, but who’s to say? On the other hand it has absorbed the modern world with more grace and consideration for history than any place I have ever seen. The Sunnis and the Shiites represent two major branches of Islam. Most of the population is Shiite Moslem, while the ruling family is Sunni. As an indication of the problems this raises, the Shaikh a while back decided that as a modern country Bahrain should have a parliament — so he appointed one. A petition was circulated, respectfully suggesting that perhaps he didn’t understand the parliament concept. Subsequently, each signer of the petition was notified that either he would remove his name or bad things would happen. The petition mysteriously disappeared. A more significant underlying problem is that the Shiites are subject to considerable discrimination. The bombings that have been happening here over the past few months appear to be derived from this. Last week, George Bush was in town, after visiting his friends in Kuwait. He made a speech here congratulating the Shaikh on his tough stand against terrorism. My Bahraini friend was very upset by this. He believed that the complexity of the situation was not adequately communicated to Mr. Bush. He considered the speech very heavy-handed. Interestingly enough, President Clinton made a speech a few days later, saying that while he endorsed by and large Bahraini policies to counter terrorism, they should be conducted with an eye to respecting human rights at the same time. This speech was not covered by the local paper (that is, the fact that the President of the United States made a speech about Bahrain was not considered newsworthy), but my friend read about it in a Lebanese newspaper. Every morning I get the local paper under my door. It is an interesting publication. It has reasonable coverage of world news, given its size, and there are lots of human interest stories about young people, the schools, and the medical profession. Its view of Barhaini news, on the other hand, is decidedly one-sided. Everything is very cheerful – and simple. Within a couple of weeks of each of the bombing incidents here, someone was caught and accused. This is reported very matter-of-factly, with the assumption that the crime has been solved. It was important that someone be arrested quickly. No mess. No fuss. Something doesn’t smell right here. It is altogether too tidy. From this paper I learned that John Major sent a letter to the Shaikh thanking him for his letter of sympathy about the Scottish school tragedy. Now, there’s news. As an American citizen abroad, I confess to finding American Embassies singularly less than helpful. The French lady I met at the skating rink and I compared the behavior of American and French diplomatic corps. The Americans apparently provide everything for the workers. They essentially transplant The United States to their compounds. The French, on the other hand, are required to live like locals. She sounded kind of envious of the American approach, but then we got to talking about what we have both observed as a consequence of this appproach: American Embassy people wind up knowing zilch about the countries where they are stationed.